(TEMPE CITY COURT)When facing a misdemeanor or DUI involving Tempe Police, your criminal case will likely be at the Tempe Municipal Court—also known as Tempe City Court. The court building is located in downtown Tempe on Fifth Street next to the Tempe Transportation Center and across from the Residence Inn Hotel. Monday through Friday 8:00 AM to 5:00 PM, except holidays. Parking for Tempe Municipal Court is across the street from in the city hall parking garage. The garage is attached to the Residence Inn Hotel. Parking is free for the first hour and $1.50 each additional hour. There’s a maximum daily rate of $12. They take card or cash. 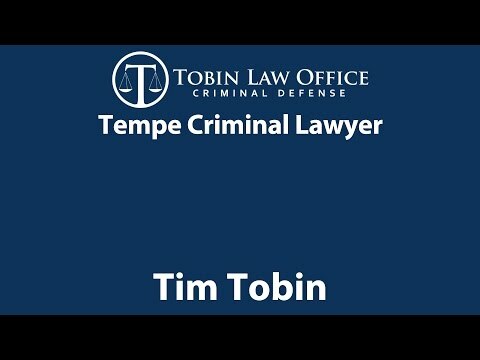 Tobin Law Office Offers Clients Effective Criminal Defense at Tempe Municipal Court. Appearing at the Tempe Court often, Tempe criminal lawyer Tim Tobin is familiar with the Tempe Judges, Tempe Prosecutors, and Tempe Police Department. Attorney Tobin, himself, is a former prosecutor who handled criminal matters out of the Tempe Police Department. For these reasons, and more, Tobin Law Office provides clients with an informed and experienced criminal defense when approaching the nuanced procedures and routines of Tempe criminal cases. When up against criminal charges in Tempe, you should consult with a criminal defense attorney who’s familiar with Tempe’s government agencies. Most importantly, you’ll want a criminal defense attorney in Tempe that can devote the required time and effort your case deserves. You should have paperwork that advises about your first court date at Tempe Municipal Court. That paperwork is either your release order or your citation. If you did not get either of those, you’ll instead get a summons in the mail that tells you when you need to go to Court. What to Do When You Get to Tempe Municipal Court for Your First Court Date. When you arrive, you’ll go through the front door and security. Don’t bring illegal items or weapons. Once through security, go straight ahead and slightly left to take the elevator upstairs. If you’re there for arraignment, you’ll go to the third floor. If you’re there for a pretrial conference, you’ll report to the second floor. There are monitors in the lobby that list everyone’s name and their assigned courtroom number. What to Wear and Bring to Tempe Municipal Court. While formal wear isn’t required, you should dress appropriately. We recommend business casual. You want to make a positive impression on the judge and prosecutor. We also recommend that you avoid wearing hats, sunglasses, sandals, and provocative or offensive clothing. Children are permitted in the court building, however, we don’t recommend bringing children to Court. If a child becomes distracting or interrupts courtroom proceedings, you may be asked to leave the courtroom. First Court Date: Arraignment at the Tempe Municipal Court. It’s mandatory to attend your Tempe Municipal Court arraignment. If you’ve hired a defense attorney, you don’t need to go. Your attorney would file the requisite paperwork to vacate the arraignment date and set a pretrial conference. Be sure to arrive on time. If you’re late or don’t show up, they’ll file a failure to appear charge, a warrant will be issued, and your driver’s license may be suspended. The Court doesn’t entertain testimony or evidence at arraignment; there’s no opportunity to argue your case at this stage of the case. The judge will merely verify your identity and contact information, read the charges, explain your rights, state potential penalties, and ask for your plea. It’s crucial that you say not guilty. You have many defenses, opportunities, and rights, which are only preserved by entering a not guilty. The arraignment isn’t the time to take responsibility. Once you plead guilty, you give up the opportunity to negotiate beneficial outcomes in your case. You also cannot change your mind later. For those reasons, always enter a not guilty plea and consult a criminal defense lawyer who regularly practices at the Tempe Municipal Court. The Judge will also order release conditions at arraignment. Specific release conditions depend on the case facts, your history, and any other information available to the Court. At Tobin Law Office, We Take the Stress Out of Going to the Tempe Municipal Court. We file all the necessary paperwork so that you don’t have to attend the arraignment. We can also go to Court in your place for most hearings so that you don’t have to take time from work and family. The Court Dates after Arraignment: Pretrial Conferences. The hearings before a trial, dismissal, or plea agreement are called pretrial conferences. At these hearings, you, or your attorney, meet with the prosecutor to exchange evidence and work towards case resolution. Tempe misdemeanors typically have several pretrial conferences before a case is resolved. The evidence is not presented to the Court at pretrial conferences. Instead, these serve as meetings with the prosecutor followed by a brief status update for the Court. If your case cannot be resolved by pretrial conferences, your case will be set for trial to determine guilt or innocence for each criminal charge. At trial, a trained prosecutor would call witnesses and present evidence in an effort to prove your guilt beyond a reasonable doubt. Potential Penalties at the Tempe Municipal Court. The Tempe Municipal Court hears only misdemeanor cases. An Arizona misdemeanor carries up to a 6 months jail, $4575 in fines and surcharges, additional financial assessments, probation, classes, treatment, community service, and more. Additionally, a misdemeanor conviction can leave you with a permanent criminal record. Maximum jail for misdemeanors is listed in the Arizona Revised Statutes: A.R.S. § 13-707. Maximum fines for misdemeanors are found in the Arizona Revised Statutes: A.R.S. § 13-802. The total fines and costs can exceed $10,000 after adding in surcharges, fees, assessments, and costs. Maximum probation periods for misdemeanors are in the Arizona Revised Statutes: A.R.S. 13-902. Class 3 Misdemeanor: 1-year probation. Other Misdemeanor Penalties. Loss of your driver’s license and constitutional rights, treatment, counseling, classes, programs, community service, restitution, and much more. DUI Penalties. Arizona has extremely harsh and unforgiving DUI statutory penalties. You can review Tobin Law Office’s blog on Arizona DUI penalties here: Arizona’s Misdemeanor DUI Penalties. It’s Wise to Retain an Experienced Tempe Criminal Defense Attorney for Your Tempe City Court Case. If you have misdemeanor or DUI case at the Tempe Municipal Court, you want a knowledgeable Tempe criminal lawyer at your side from start to finish. A dedicated and experienced Tempe criminal defense lawyer is in the best position to dismiss or reduce charges, limit penalties, and protect your future. Criminal Traffic: Title 28 Offenses, Excessive Speeding, Aggressive Driving, Reckless Driving, Driving on a Suspended License, and more. Frequently Asked Questions about Criminal Cases at the Tempe Municipal Court. What if there’s a warrant for my arrest from the Tempe Municipal Court? If there’s a Tempe warrant for your arrest, you’ll likely be arrested upon any police contact. In addition, outstanding warrants can lead to the suspension of your driver’s license. If there’s a warrant for your arrest from the Tempe Municipal Court, you’ll need to take one of three actions to address it. One option is to visit the Tempe Municipal Court and pay the bond set by the Judge. When you pay the bond, court staff will provide you a new court date. Another option is to visit the Judge during walk-in hours between 9:00 a.m. and 11:30 a.m., Monday through Friday. If you see the Judge during walk-in hours, the Judge can either quash your warrant or hold you in custody until your bond is paid. The third option is to hire an attorney to take care of it for you. Tobin Law Office can help you with your Tempe warrant by either filing a written motion to quash or personally appearing on your behalf to quash the warrant. By quashing the warrant for you, you won’t have to post a bond or personally appear in Court. Simply not attending your court date is a bad idea. Failing to appear will result in a warrant for your arrest, additional charges, and the suspension of your driver’s license. You have two options: hire a criminal defense attorney or go to the court to request a new court date. About Your Tempe Municipal Court Case.